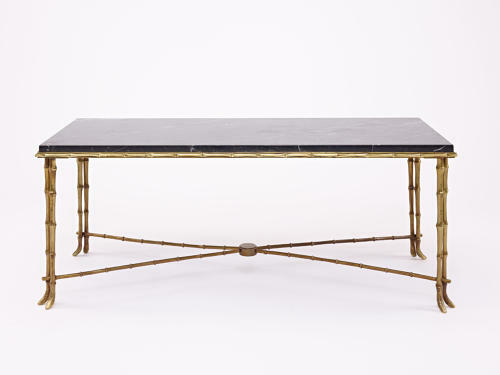 Exceptional gilt bronze coffee table with a venegrated black marble top, faux bamboo legs and stretchers. Produced circa 1950 in Paris by Maison Bagues, the leading French design house of the 20th century. This is a very rare design with the "double leg". The company usually worked with glass and lacquer so perhaps this design was used to support the heavier marble top. Very high quality and in very good condition. No damage to the marble and the gilt bronze legs and stretchers all match (despite the light making the stretchers look darker in some of the photos).